MP4 is a very popular format that is used to store audio and video as well as other media types such as still images and sub title information. Technically speaking mp4 is actually the filename extension and signifies the fact that a file with that extension has been encoded using MPEG-4 which is the actual name for the multimedia format itself. MP4 takes its history from the quicktime multimedia format, which it is very closely based upon. MP4 was first released in 2001 and has flourished ever since, going on to become one of the most well-known digital multimedia formats. OGG is also a digital multimedia format, files of which can also encapsulate video, audio, still images and sub title information. One of the key differences in the ogg format is that it is an open source format – this essentially means that anyone can access the source code for the format and can also contribute to its development making it a fast and efficiently expanding file format. The ogg file format was originally conceived in 1993, originally named Squish but forced to rename after copyright issues with another company. Aside from its open source routes, ogg is also considered by many to be a superior format to mp3 as it produces better quality at lower bitrates when compared to other similar multimedia containers. The OGG format is popular amongst developers because there are no royalty payments required for its use and this also makes it very popular in the gaming industry; many popular video game engines support OGG including Doom 3 and Halo: Combat Evolved. There is often a requirement to convert MP4 to OGG – sometimes because of the quality at lower bitrates and sometimes to move away from the royalties based format that is MP4. Other reasons may include the need to have ogg support for a particular hardware device. 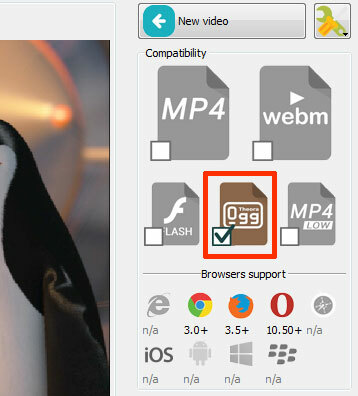 There is a service on the internet called EasyHTML5Video who provide a great mp4 to ogg converter which is very simple to use and makes converting from MP4 to OGG and OGG to MP4 a breeze.